Christ Jesus died on the Cross to redeem mankind, to save us from our sins because of his love for us. As recorded in the Gospels of Matthew, Mark, Luke, and John in the Holy Bible, Jesus Christ was mocked, scorned, and tortured in the praetorium. He carried his cross up the Via Dolorosa in Jerusalem to Calvary, was nailed to the Cross, and hung between two common criminals. He suffered an indescribable end, recalled by the Church on Good Friday of Holy Week. 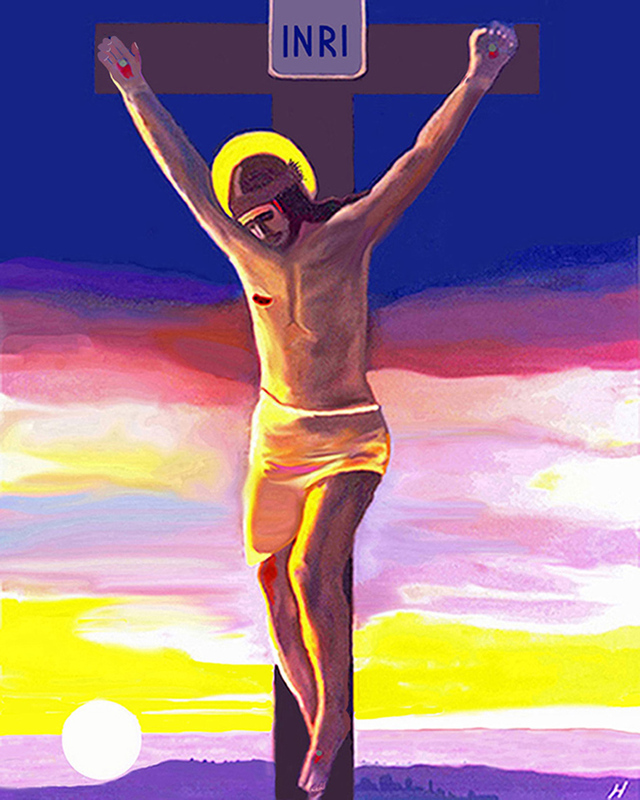 One may meditate on the Passion of Christ by reflecting on his Seven Words on the Cross or by a devotion known as The Way of the Cross. When religious pilgrimages to the Holy Land ended with military occupation of Jerusalem in the Middle Ages, a popular devotion known as The Way of the Cross arose during Lent retracing the Passion, Crucifixion, and Death of Jesus. The fourteen Stations of the Cross are (1) Pilate condemns Jesus to death; (2) Jesus takes up his Cross; (3) He falls the first time; (4) Jesus meets his sorrowful mother Mary; (5) Simon helps carry the cross; (6) Veronica cleans his face; (7) He falls the second time; (8) Jesus consoles the women of Jerusalem; (9) He falls the third time; (10) Jesus is stripped of his garments; (11) Jesus is nailed to the cross; (12) Jesus Christ dies on the cross; (13) Our Lord is taken down from the cross; (14) Christ is laid in the tomb. Here are his Seven Words, the last seven expressions of Jesus Christ on the Cross recorded in Scripture. Jesus of Nazareth is looking down from the cross just after he was crucified between two criminals. He sees the soldiers who have mocked, scourged, and tortured him, and who have just nailed him to the cross. He probably remembers those who have sentenced him - Caiaphas and the high priests of the Sanhedrin. Pilate realized it was out of envy that they handed him over (Matthew 27:18, Mark 15:10). But is Jesus not also thinking of his Apostles and companions who have deserted him, to Peter who has denied him three times, to the fickle crowd who only days before praised him on his entrance to Jerusalem, and then days later demanded his crucifixion? Is he also thinking of us, who daily forget him in our lives? Does he react angrily? No! At the height of his physical suffering, his love prevails and He asks His Father to forgive! Could there ever be greater irony? Jesus asks his Father to forgive, but it is by His very Sacrifice on the Cross that mankind is able to be forgiven! Right up to his final hours on earth, Jesus preaches forgiveness. He teaches forgiveness in the Lord's prayer: "Forgive us our trespasses, as we forgive those who trespass against us" (Matthew 6:12). When asked by Peter, how many times should we forgive someone, Jesus answers seventy times seven (Matthew 18:21-22). He forgives the paralytic at Capernaum (Mark 2:3-12), the sinful woman who anointed him in the home of Simon the Pharisee (Luke 7:37-48), and the adulteress caught in the act and about to be stoned (John 8:1-11). During the Institution of the Eucharist at the Last Supper, Jesus tells them to drink of the cup: "Drink of it, all of you; for this is my blood of the covenant, which is poured out for many for the forgiveness of sins" (Matthew 26:27-28). And even following his Resurrection, his first act is to commission his disciples to forgive: "Receive the Holy Spirit. If you forgive the sins of any, they are forgiven; if you retain the sins of any, they are retained" (John 20:22-23). Now it is not just the religious leaders or the soldiers that mock Jesus, but even one of the criminals, a downward progression of mockery. But the criminal on the right speaks up for Jesus, explaining the two criminals are receiving their just due, whereas "this man has done nothing wrong." Then, turning to Jesus, he asks, "Jesus, remember me when you come in your kingdom" (Luke 23:42). What wonderful faith this repentant sinner has in Jesus - far more than the doubting Thomas, one of his own Apostles. Ignoring his own suffering, Jesus responds with mercy in His second word, living out his own Beatitude, "Blessed are the merciful, for they shall obtain mercy." The second word again is about forgiveness, this time directed to a sinner. Just as the first word, this Biblical expression is found only in the Gospel of Luke. Jesus shows his Divinity by opening heaven for a repentant sinner - such generosity to a man that only asked to be remembered! This expression offers us hope for salvation, for if we turn our hearts and prayers to Him and accept his forgiveness, we will also be with Jesus Christ at the end of our lives. Jesus and Mary are together again, at the beginning of his ministry in Cana and now at the end of his public ministry at the foot of the Cross. John is the only Evangelist to record Our Lord's mother Mary at the Cross. The Lord refers to his mother as woman at the Wedding Feast of Cana (John 2:1-11) and in this passage, recalling the woman in Genesis 3:15, the first Messianic prophecy of the Redeemer, anticipating the woman clothed with the sun in Revelation 12. What sorrow must fill Mary's heart! How she must have felt meeting her Son as he carried the Cross on the Via Dolorosa. "Behold I make all things new" (Revelation 21:5). And then she had to watch him being nailed to the Cross. Once again, a sword pierces Mary's soul: we are reminded of the prophecy of Simeon at the Presentation of the infant Jesus in the Temple (Luke 2:35). The loved ones of Jesus are with Him in John's Gospel. There are four at the foot of the cross, Mary his Mother, John, the disciple whom he loved, his mother's sister Mary the wife of Clopas, and Mary Magdalene. He addresses his third word to his mother Mary and John, the only eye-witness of the Gospel writers. Jesus again rises above the occasion as he cares for the ones that love him. The good son that He is, Jesus is concerned about looking after his mother. St. Joseph was noticeably absent. St. Joseph was not present at family occasions like the Wedding Feast of Cana and had probably died before the public ministry of Jesus, or else he would have been the one to take care of Mary following the Passion of Our Lord. In fact, this passage indicates that Jesus was the only child of Mary, because if he did have natural brothers or sisters, they would have provided for her. But Jesus looks to John to care for her. Another striking phrase indicating Jesus of Nazareth was an only child is Mark 6:3, referring to Jesus: "Is not this the carpenter, the son of Mary, and the brother of James and Joses and Judas and Simon, and are not his sisters here with us?" The terms brother and sister in Hebrew or Aramaic at that time could mean either biological sibling, cousin or kinsman, or a spiritual brother or sister. Now if James, Joses and Judas and Simon were also natural sons of Mary, Jesus would not have been called the "son of Mary," but rather "one of the sons of Mary." This was the only expression of Jesus in the Gospels of Matthew and Mark. Both Gospels related that it was in the ninth hour, after 3 hours of darkness, that Jesus cried out this fourth word. The ninth hour was three o'clock in Judea. After the fourth Word, Mark related with a horrible sense of finality, "And Jesus uttered a loud cry, and breathed his last" (Mark 15:37). One is struck by the anguished tone of this expression in contrast to the first three words of Jesus. He feels separated from his Father. This cry is from the painful heart of the human Jesus who must feel deserted by His Father and the Holy Spirit, not to mention his earthly companions the disciples, who "all left him and fled" (Matthew 26:56, Mark 14:50). As if to emphasize his loneliness, Mark (15:40) even has his loved ones "looking on from afar." Jesus is now all alone, and he must face death by himself. But is not this exactly what happens to all of us when we die? We too are all alone at the time of death! Jesus completely lives the human experience as we do, and by doing so, frees us from the clutches of sin. His fourth Word is the opening line of Psalm 22, and thus his cry from the Cross recalls the cry of Israel, and of all innocent persons who suffer. Psalm 22 of David makes a striking prophecy of the crucifixion of the Messiah at a time when crucifixion was not known to exist: "They have pierced my hands and my feet, they have numbered all my bones" (22:16-17). The Psalm continues: "They divide my garments among them, and for my vesture they cast lots" (22:18). There can not be a more dreadful moment in the history of man as this moment. Jesus who came to save us is crucified, and He realizes the horror of what is happening and what He now is enduring. He is about to be engulfed in the raging sea of sin. Evil triumphs, as Jesus admits: "But this is your hour" (Luke 22:53). But it is only for a moment. The burden of all the sins of humanity for a moment overwhelm the humanity of our Savior. But does this not have to happen? Does this not have to occur if Jesus is to save us? It is in defeat of his humanity that the Divine plan of His Father will be completed. It is by His death that we are redeemed. "For there is one God. There is also one mediator between God and the human race, Christ Jesus, himself human, who gave himself as ransom for all" (I Timothy 2:5-6). By his wounds you have been healed." The fifth word of Jesus is His only human expression of His physical suffering. Jesus is now in shock. The wounds inflicted upon him in the scourging, the crowning with thorns, losing blood on the three-hour walk through the city of Jerusalem on the Via Dolorosa to Golgotha, and the nailing upon the cross are now taking their toll. The Gospel of John first refers to thirst when Jesus meets the Samaritan woman at the well. After first asking for "a drink," he answers the woman, “Everyone who drinks of this water will be thirsty again, but those who drink of the water that I will give them will never be thirsty. The water that I will give will become in them a spring of water gushing up to eternal life" (John 4:13-14). This passage implies there is more than just physical thirst. "This is my commandment, that you love one another as I have loved you. The Gospel of John recalls the sacrifice of the Passover Lamb in Exodus 12 in this passage. The soldiers offered wine on a sprig of hyssop to the Lord. Hyssop is a small plant that was used to sprinkle the blood of the Passover Lamb on the doorposts of the Hebrews (Exodus 12:22). John's Gospel related that it was the Day of Preparation, the day before the actual Sabbath Passover, that Jesus was sentenced to death (19:14) and sacrificed on the Cross (19:31). John continues in 19:33-34: "But when they came to Jesus and saw he was already dead, they did not break his legs," recalling the instruction in Exodus 12:46 concerning the Passover Lamb. He died at the ninth hour (three o'clock in the afternoon), about the same time as the Passover lambs were slaughtered in the Temple. Christ became the Paschal or Passover Lamb, as noted by St. Paul: "For Christ our Passover lamb has been sacrificed" (First Corinthians 5:7). The innocent Lamb was slain for our sins, so that we might be forgiven. It is now a fait accomplit. The sixth word is Jesus' recognition that his suffering is over and his task is completed. Jesus is obedient to the Father and gives his love for mankind by redeeming us with His death on the Cross. The above painting is meant to capture the moment. What was the darkest day of mankind became the brightest day for mankind. And the Gospels as a group captured this paradox. The Synoptic Gospels narrated the horror of the event - the agony in the garden, the abandonment by his Apostles, the trial before the Sanhedrin, the intense mockery and torture heaped upon Jesus, his suffering all alone, the darkness over the land, and his death, starkly portrayed by both Matthew (27:47-51) and Mark (15:33-38). In contrast, the passion of Jesus in the Gospel of John expresses his Kingship and proves to be His triumphant road to glory. John presents Jesus as directing the action the entire way. The phrase "It is finished" carries a sense of accomplishment. In John, there is no trial before the Sanhedrin, but rather Jesus is introduced at the Roman trial as "Behold your King!" (John 19:14). Jesus is not stumbling or falling as in the Synoptic Gospels, but the way of the Cross is presented with majesty and dignity, for "Jesus went out bearing his own Cross" (John 19:17). And in John, the inscription at the head of the cross is pointedly written "Jesus of Nazareth, The King of the Jews" (John 19:19). The inscription INRI at the top of the cross is the Latin Iesus Nazarenus, Rex Iudaeorum. When Jesus died, He "handed over" the Spirit. Jesus remained in control to the end, and it is He who handed over his Spirit. One should not miss the double entendre here, for this may also be interpreted as His death brought forth the Holy Spirit. The Gospel of John gradually reveals the Holy Spirit. Jesus mentions living water in John 4:10 and during the Feast of Tabernacles refers to living water as the Holy Spirit in 7:37-39. At the Last Supper, Christ announces he would ask the Father to send "another Advocate to be with you always, the Spirit of truth" (14:16-17). The word Advocate is also translated as Comforter, Helper, Paraclete, or Counselor. "But the Advocate, the Holy Spirit, whom the Father will send in my name, will teach you everything, and remind you of all that I have said to you" (14:26). The symbolism of water for the Holy Spirit becomes more evident in John 19:34: "But one of the soldiers pierced his side with a spear, and immediately there came out blood and water." The piercing of his side fulfills the prophecy in Zechariah 12:10: "They will look on me whom they have pierced." The piercing of Jesus' side prefigures the Sacraments of Eucharist (blood) and Baptism (water), as well as the beginning of the Church. The seventh word of Jesus is from the Gospel of Luke, and is directed to the Father in heaven, just before He dies. Jesus recalls Psalm 31:5 - "Into thy hands I commend my spirit; thou hast redeemed me, O Lord, faithful God." Luke repeatedly pleads Jesus' innocence: with Pilate (Luke 23:4, 14-15, 22), through Dismas the criminal (by legend) (Luke 23:41), and immediately after His death with the centurion - "Now when the centurion saw what had taken place, he praised God and said, "Certainly this man was innocent" (Luke 23:47). Jesus was obedient to His Father to the end, and his final word before his death on the Cross was a prayer to His Father. 1 Navarre Revised Standard Version of the Holy Bible. Four Courts Press, Dublin, Ireland, 2001. 2 Bishop Fulton J. Sheen. The Seven Last Words: The Message from the Cross. Garden City Books, Garden City, New York, 1952. 3 Pope John Paul II. The Gospel of Life, the encyclical Evangelium Vitae, Times Books, New York, March 25, 1995. 4 Ignace De La Potterie. The Hour of Jesus: The Passion and Resurrection of Jesus. Alba House, Staten Island, New York, 1989. 5 St. Thomas Aquinas. Summa Theologica, Third Part - The Passion of Christ. Translation: Fathers of the English Dominican Province, 1920. Christian Classics, Allen, Texas. 6 St. Alphonsus Liguori. The Way of the Cross. Barton Cotton, Baltimore, Maryland, 1977. 7 Martin F, Wright WM. The Gospel of John. Baker Academic, Grand Rapids, Michigan, 2015.